On of my favorite places on earth is Petershams Nursery. It is outside of London. One takes a bus out to Richmond, then walks till the nursery sign painted on the side of a building becomes visible. Follow the arrow down the alleyway and then walk toward an open field. Their is a wide drive filled with various farm vehicles and finally the gates open to Petershams. Inside are glass housed filled with plants, and enormous garden center with the glorious and the mundane. In the very back is an old greenhouse and when the sun hits the glass panes, there old loamy funk of a greenhouse seeps in. In that old greenhouse are tables and chairs and some really wonderful food. The chef who got the ball rolling at Petershams was Skye Gyngell. At the beginning, she brought her own pots and pans every day. Soon a tiny kitchen was added in an old brick room behind the greenhouse and before long, the nursery was a dinning destination. Alas, with all this fame came what every chef wants, a Micheline star, but the star proved to be the demise of Gyngell. Some diners felt the star meant valet parking, white tablecloths and well, a floor. Sadly, she left and new chef came. Back in London, n the same vein of glorious simple cooking, Ruth Rogers and Rose Gray presided over The River Cafe, another food destination and starting point for many an illustrious English cooking career. 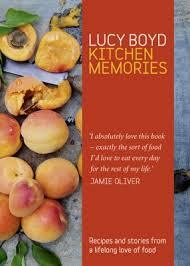 Which brings us to today's cookbook, Kitchen Memories, by Lucy Boyd. Lucy Boyd is Rose Gray's daughter. After spending many years in the kitchen at The River Cafe, and many more at home cooking with her mother and family, Boyd went on to become the gardener at Petershams Nursery, growing the vegetables that graced Skye Gyngell's menus. If Gyngell wanted to try something, Boyd grew it for her. This wasn't farm-to-table eating this was literally table-IN-the farm eating and it couldn't be better. It is clear that Boyd did not fall far from the tree. Her recipes are inviting, simple and about all else delicious. This simple chicken dish will leave you wanting more. Season the chicken pieces well all over with salt and pepper. Heat a drizzle of the olive oil in a shallow, heavy-based pan, add the chicken pieces and brown them on all sides -- it may be easier to brown them in batches if your pan is too small to to fit them without overlapping. Using a slotted spoon, transfer the chicken to a bowl. Put the garlic and spice mixture into the still-hot pan (you may need to add a little more oil) and stir to release their flavours. Add the ginger and chopped chilli and stir-fry for a minute or so. Add the chicken pieces and any juices that have been released, then add 8 tablespoons of water and the lemon juice. Stir, then turn up the heat and bring to a boil, cover with a tight-fitting lid and turn the heat right down to a gentle simmer. Cook for 15 minutes until the chicken is tender and cooked through. Remove the lid and scatter the chopped coriander over the top. Serve with spiced basmati rice. You may not have a gardener or a greenhouse, but get yourself a nice pot of coriander (or cilantro as we Yanks call it) and set it in the window. Then you will be ready for this lemony chicken.